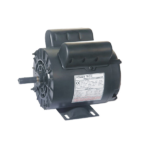 The 2 to 5 HP motors are designed for replacing OEM air compressor motors where “SPL” type electric motors are typically used. These are generally used for home or small shops applications. They are powerful and can also may be used/suitable for other applications having similar loads such as pumps, conveyors, fans, blowers and coolers. They are manufactured by Power Tech Electric Motors (PTEM), an ISO 9001 factory and have a 2 Year Manufacturer’s Limited Warranty plus they carry CSA, CE and CCC rating.